Debates around the ‘sport for development and peace’ (SDP) movement have entered a new phase, moving on from simple questions surrounding the utility of sport as a tool of international development. 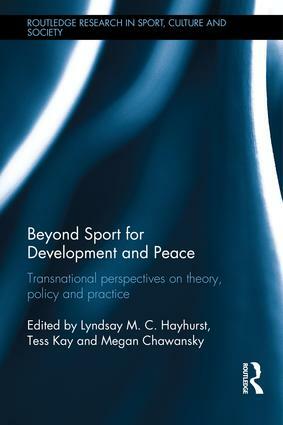 Beyond Sport for Development and Peace argues that critical research and new perspectives and methodologies are necessary to balance the local aspects and global influences of sport and to better understand the power relations embedded in SDP on a transnational scale. As the era of the Millennium Development Goals gives way to a new agenda for sustainable development, this book considers the position of SDP. The book brings together contributors from 15 different countries across the developed and developing worlds, including academic researchers and ‘on the ground’ experts, practitioners and policy-makers, to provide one of the most diverse set of perspectives assembled in SDP scholarship. Looking to the renewed development agenda, its authors explore theoretical, policy and practical dimensions that address the broadening geographical and cultural spread of SDP, the emergence of issues such as child protection within it, its increased capacity for critical reflection on practice, and its potential for new collaborative approaches to knowledge production. Through its combination of academically-led chapters paired with practice-oriented ‘responses’ it offers an important reconceptualization of SDP as a contributor to development policy, and opens up important new avenues for studying and ‘practising’ SDP. Beyond Sport for Development and Peace is therefore essential reading for all researchers, advanced students, policy-makers and practitioners working in sport development or international development.